Google may be confident it has a better Maps product than that offered by Apple, but that doesn’t mean the Mountain View company is going to waste time resting on its laurels as Apple does its best to catch up. Eager to maintain its lead, the web giant on Tuesday rolled out the first update (v1.1) to the all-new iOS Maps app it launched back in December, bringing with it several new features. Users are now just a few taps away from accessing information about points of interest in their immediate vicinity. Need a gas station? Tap the search box, tap the gas station icon and locations of nearby businesses will pop up on your screen as red dots. Icons for a wide range of establishments have been added, enabling you quick access to information about local restaurants, coffee shops, bars, post offices and more. A tap on one of the red dots will bring up more information about the business, such as its address and any available reviews. Another notable addition to the app is integration with Google Contacts. So if you have a Google account with a database of names and addresses, and you’re signed in, the app will suggest an address when you type your friend’s name into the search box. Tap to confirm and you’ll be shown the address location on the map. Also, you can now choose between miles or kilometers (via the app’s Settings page) for distance information. In case you don’t yet have it (really? you don’t? 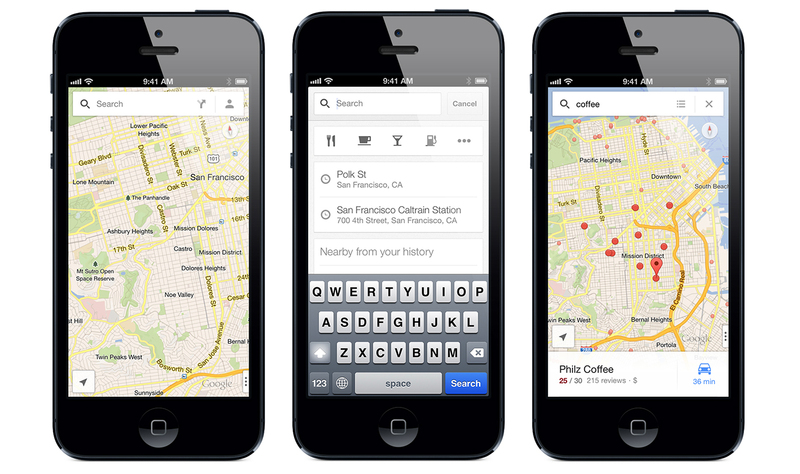 ), Google’s free Maps app for iDevices is available from the iTunes store here. Google’s popular Maps app was booted off iOS devices by Apple in September last year following the Cupertino company’s decision to replace it with its own Maps app with the roll out of iOS 6. Apple’s effort soon came under fire for being sub-standard, with reports of an entire city ending up in the sea and a farm being shown as an airport gaining particular prominence. The mounting criticism led to Apple boss Tim Cook issuing a letter apologizing for launching a product that clearly wasn’t ready. So when Google launched its all-new Maps app in December, you can imagine what many iPhone owners wasted no time in doing.